JUST STEPS FROM THE OREGON DUNES! Our Family invites you to view & hike the unique Oregon Dunes out our back door or fish off our dock on Woahink Lake. We are close to Old Town, dining, ATV rentals, golf, beaches, hiking, lighthouses & Sea Lion Caves. Great quiet and dog friendly park, close to the beach and town. Spaces are plenty big with some grass nice clean restrooms and laundry room. Staff is extremely friendly with plenty of suggestions for town. Semi private fishing across the street. We stayed a week and would stay again. This is such a nice, clean park! Owners are very friendly and take great care of maintenance of grounds. Spacious sites are nice and private because of manicured hedges. Love location, backs up to dunes, very close to town. Will be back! Great place too stay with friendly staff. Been living here since July 2016, as I traveled up and down the Oregon, Washington and British Columbia coasts. Very well maintained, family run park with direct access to the Oregon Dunes Recreation area, Lake Wohanik, and downtown Florence is only ten minutes away. Great place to stay for an extended period, as you explore the Oregon coast. I highly recommend this park. Wonderful family owned campground. We were pleasantly surprised with this campground. We had not made a reservation. Fortunately it was the middle of the week and they had a couple of open sites. We stopped here because we wanted to see the dunes, which are spectacular. From this campground you could walk right up on the dunes, they also provide a dock and access to a lake on the other side of the campground. It is family run with very friendly and easy to talk to individuals. 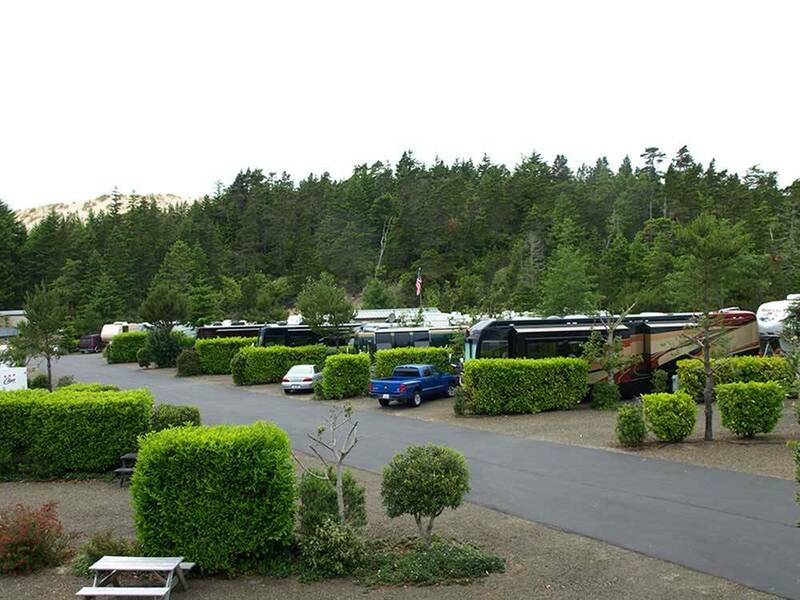 The campsites are level with well maintained hedges between each campsite. The park is located between the sand dunes and Lake Woahink, close to Florence right on Hwy 101. Easy in and out with fairly large pull through that have hedges between sites. Sites are gravel and fairly level with utilities that work great. The laundry and restrooms/showers are nice. There is a paved access road and a walking trail to the dunes, and there is a private beach for guests across the hwy at Lake Woahink (big lake). Staff was friendly and helpful. Pet friendly and there is a community fire pit. There is also a nice Myrtlewood shop right next door. We would definitely stay again. The staff were super friendly and helpful!! The park is a nice size with lovely shrubbery separating the sites. Easy access to area attractions ...dunes, Florence, Heceta Lighthouse etc. Park backs onto the dunes for those who are ATV enthusiasts .....lake access across the hiway was also nice and has great potential for future development. Ourselves and another couple stayed here for three nights. The park has wide level pull throughs with hedges between. Facilities are older but very well maintained. The staff is the friendliest I have ever seen. On the day we were to leave one member of our party was hospitalized for emergency surgery. The management was very helpful telling us to stay as long as we needed and giving us advice about the area. We ended up staying two extra days. Would definitely stay again. We stayed at the end of Sept, over a weekend as part of a RV Group Outing. We had a pull-thru site with full hook-ups. They have both pull-thrus and back-ins. This is an older park, but the sites are roomy and the hook-ups easy to use. Buildings are older, but they are actively making improvements. Sites are gravel and level. The sites are separated by hedges/bushes, but are wide enough that we didn't find it a problem. Each site has a nice picnic table. They have direct hiking and ATV access to the sand dunes. Access to Woahink Lake is across the highway, and offers a nice area to enjoy the lake views and includes a small dock. The Park is a family owned and operated facility. They are super friendly and helpful. The Park is conveniently located near Honeyman State Park, and other activities and attractions in the Florence area.